Despite the growing threats, less than 30 percent of Internet users are concerned with the security of their data online. 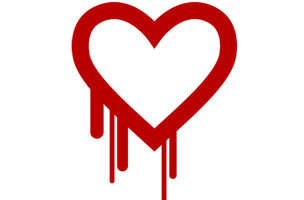 News of the Heartbleed security flaw rocked the Internet world. While the fix was implemented quickly, the bug, which impacted more than 500,000 websites including some of the biggest social networks, had been in the system for two years. According to a Pew poll conducted in the aftermath of the Heartbleed discovery, about 60 percent of the the public had heard at least “a little” about the problem. Awareness was highest among college-educated households at 77 percent, which resulted in this segment of the population feeling most at risk. Indeed, about 64 percent of Americans with some college education or a college degree said they felt vulnerable because of the Heartbleed news. 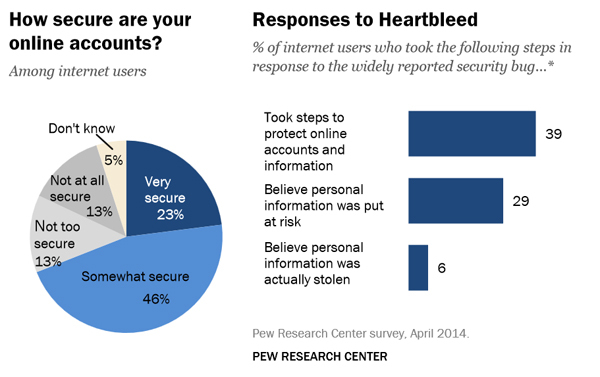 Still, only 39 percent of Internet users, or 61 percent of those aware of the Heartbleed bug, took steps to protect themselves, according to the Pew report. Again, those with college education were most likely to take action. Nearly 50 percent of those with a college education and an income over $75,000 changed their passwords. Despite the news about online security and privacy issues, more than 60 percent of survey respondents said they felt their information was at least “somewhat secure.” Eighty-four percent of online African Americans reported feeling confident their data was “very secure,” while nearly 40 percent of online Hispanics felt their information was “not too” secure or “not secure at all.” White users fell somewhere in the middle.